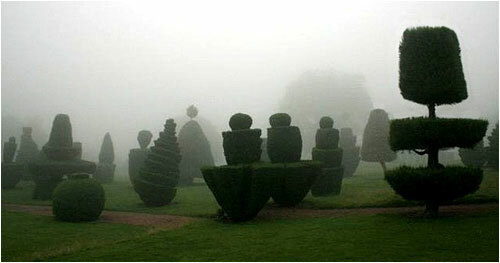 The topiary’s odd shapes are characteristic of the general style at Fingask, a place which has never paid much attention to fashion, has sometimes been behind the times, sometimes in advance of them, but mostly has ignored them completely. 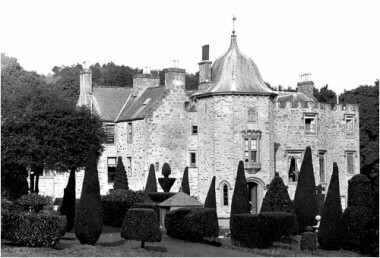 The estate has belonged to the Threipland family for most of the past 400 years, though they had to buy it back four times. (They lost it twice in the 18th Century, for supporting the old and then the young pretender. Cue the obvious comment by Lady Bracknell in the voice of Dame Edith.) Conscious ornamental gardening seems to have begun here in the late seventeenth century when Sir Patrick, the Threipland of the day, and his resoundingly named second wife, Eupheme Conqueror, planted quantities of box, holly and yew, which tradition has it eventually became the first pieces of Fingask topiary. 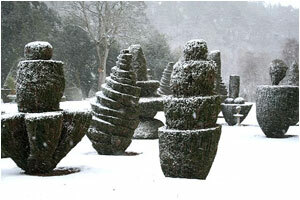 Nowadays, the topiary pieces are mostly arranged in an erratic sort-of-line in front of the Castle (not in a line any sergeant-major would allow to pass muster). As a visitor comes up the steep slope from the village they provide, as the first things are seen, a quirkily dramatic ‘The aliens have landed’ moment. One group of pieces is reputed to represent the crown jewels but, just as they are arranged according to no particular pattern, so most have no particular subject. What they do have, though, is a common style: a very informal one, of drunken leanings and irregular swirls; and it is precisely that home-made, hand-made, doing-our-own-thing quality which gives them their charm.